Postcard #1: If I'm reading the text across the bottom of the card correctly, it states: "EN BEAUCE. Troupeau de Moutons." Beauce is an agricultural region in northern France. This website calls it "one of the two historic breadbaskets of France. This is a gently undulating plateau where vast wheat fields stretch as far as they eye can see." Troupeau de Moutons, meanwhile is a "flock of sheep. "1 And, indeed, this is a flock of sheep, along with a berger (shepherd) and several meule de foin (haystacks). 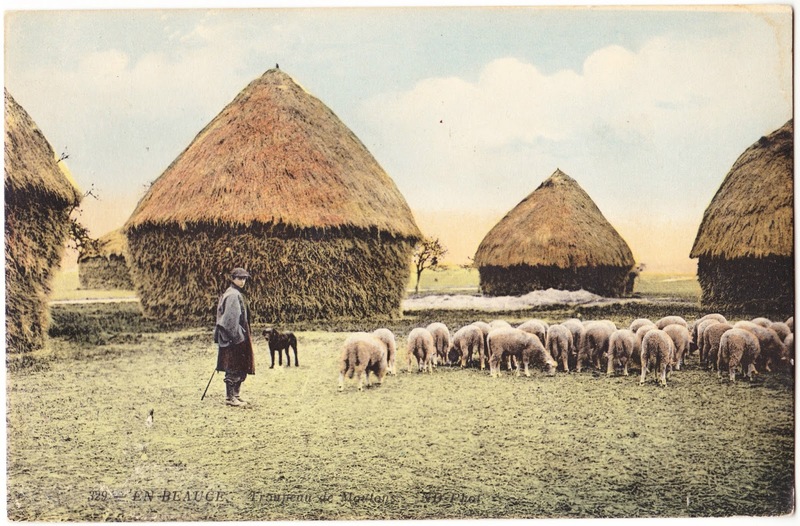 "We came out to Brittany today and passed by thousands of these haystacks and sheep — We shall be home 3 weeks from today — You and Sallie must be there — Love & Kisses for you & Sallie"
Postcard #2: "Where twined the Path", Trossachs. 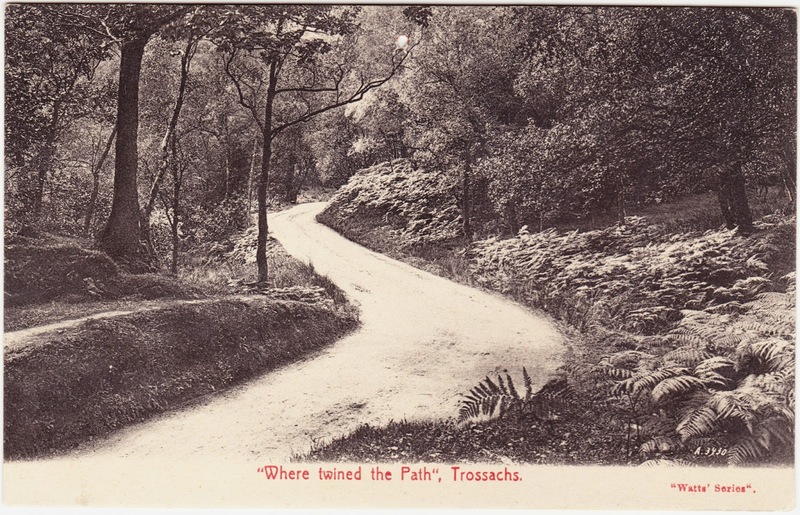 The Trossachs is a small wooded valley (glen) in Scotland, renowned for its natural beauty.3 "Where twined the Path" is a line from The Lady of the Lake, a poem by Sir Walter Scott that is set in the Trossachs. This postcard was never used, but there's a small hole near the top. I assume that it was nailed or thumb-tacked to someone's wall or bulletin board. I wonder how this postcard inspired him or her.4 Was it a place they longed to visit? A place they remembered from their childhood? Or just fodder for daydreams and the fires of the imagination? Could that person have ever dreamed that this postcard would outlive them, be made available for the whole world to potentially see, and possibly inspire future dreamers and creators? 1. If you're wondering, "Flock of Seagulls" in French is troupeau de mouettes. 2. Rangeley was previously mentioned in the post "Lovers Lane, along the shore of Rangeley Lakes in Maine." 3. The Trossachs were previously mentioned in the post "Alba in five vintage postcards." 4. I like this postcard because it conjures up thoughts of what Sarah and I call "The Mystery Forest." > If you're wondering, "Flock of Seagulls" in French is >troupeau de mouettes. You beat me to the punch. That's exactly what I was thinking.